This is an inert and totally safe 10mm caliber pistol cartridge. Designed as a medium velocity semi-automatic pistol cartridge, the 10 x 25mm Auto was used by the FBI in the field, but it was deemed over-powerful for their use and led to the creation of the shortened 0.40" S&W cartridge. 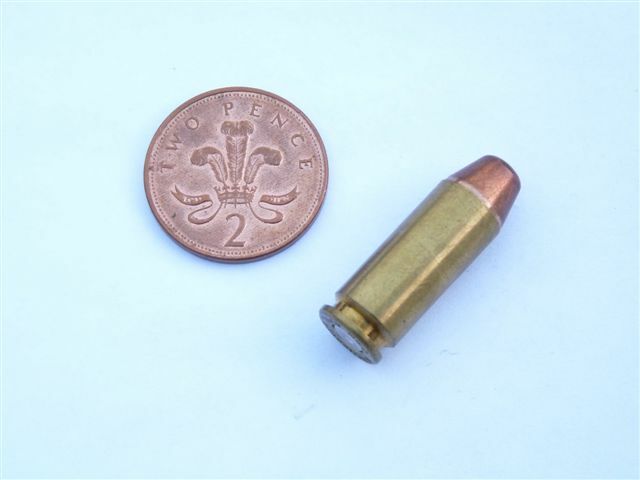 This 10 x 21mm round was thus referred to as the 0.40 'short and weak' by the 10mm Auto diehards. Available with a soft lead head or full metal jacket (illustrated).